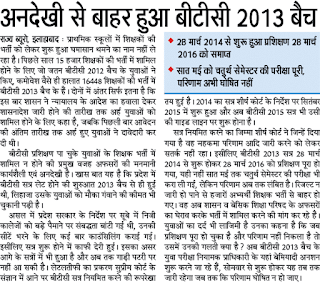 UP Sahayak Adhyapak Bharti 2019 : Latest news Sahayak Adhyapak bharti of 68,500 Applicant will be starting in December and it will as written exam and admit card also issue. 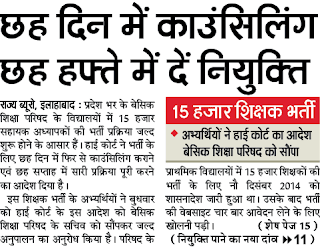 Allahabad high court have cancelled and said supreme court will take decision whether to give joining or not because applicant have gone to supreme court in sanshodhan of 15th rule and TET Marks queries. Passed B.T.C. or Special B.T.C. in Any Recognized Board or University with Passed T.E.T. Examination. 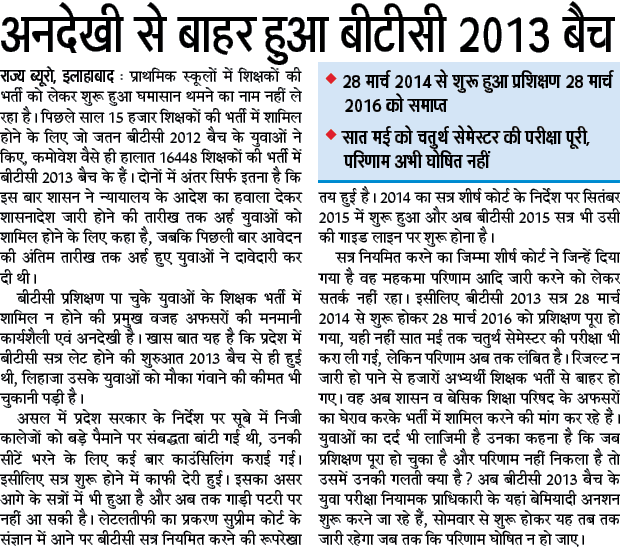 Merit List Announced : with in two months. 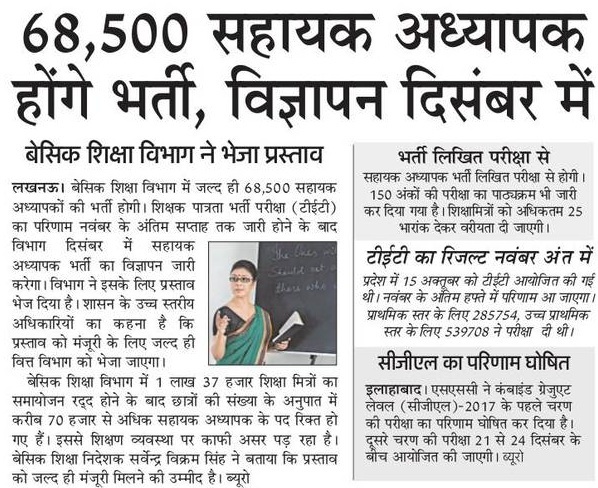 Sahayak Adhyapak in Higher Secondary School: 5390 posts. 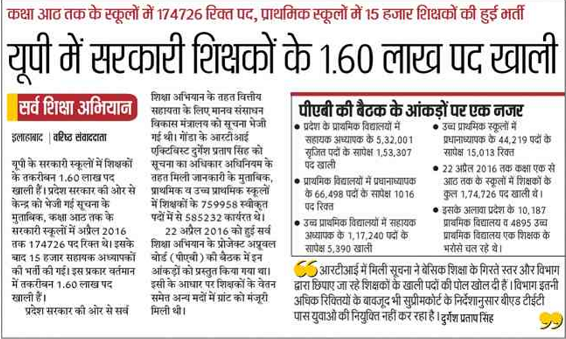 Class 1 to 8th vacant posts: 1, 74, 726 posts is vacant (1 Lakh 60000 Jobs released on 4 April data). 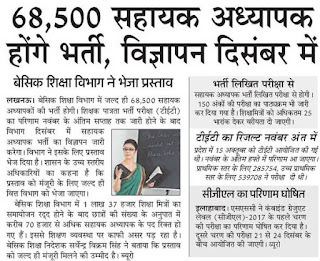 UP 68,500 BTC Merit List 2017 Urdu Teacher Cut off marks: In January from all district Candidates can get BTC cut off marks if they not apply from home district. Educational Qualification : UPTET, CTET Qualified BTC & Special (Vishishth) BTC Passed Candidates are Eligible to apply online for these 16460 BTC Posts. Age Limit : Candidates Minimum BTC age limit for Vacancy should be 21 years to 40 years. Important Notice: Candidates can Apply Online in Other Districts, When There are No Vacancies in their Home District. 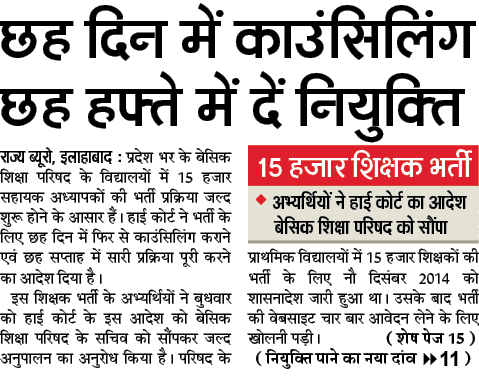 Application Fee :for General & OBC Candidates Rs. 500/- & for SC/ST/ Reserved Category Rs. 200/-.No need to pay fees for Physically Handicapped Candidates. in which 12460 BTC and 4000 Urdu Teacher Total 16460 Sahayak Adhyapak Vacancy Online form is Published to apply Online for UP BTC Assistant Teacher Recruitment 2017.A government order was issued on 22 December to fill BTC Vacancy 2017 under Basic Shiksha Parishad. Starting Date for Online application was started on 28.12.2016. Below are some related UP Assistant Teacher Bharti 2017, Merit List, Cut off marks and all vacancy is available in district wise mode. 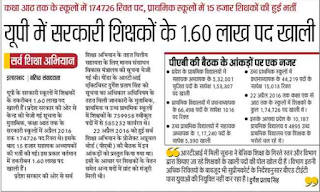 Some BTC 12460 Vacancy which have good posts to apply for another districts Pratapgarh 360 Posts, Sitapur 1268 Posts, Gonda 788 Posts, Ballia 720 Posts, Hathras 535 Posts and Rampur: 432 Posts.